Bella was about 9 months old when we adopted her through Australian Cattle Dog Rescue. On the plus side, she was a beautiful dog, highly intelligent, and very friendly towards people. On the down side, she had been living on the streets and had absolutely no manners. I quickly realized that I'd need professional help to train her. I found a trainer who had experience working with cattle dogs. Bella and I began working with him twice a week. 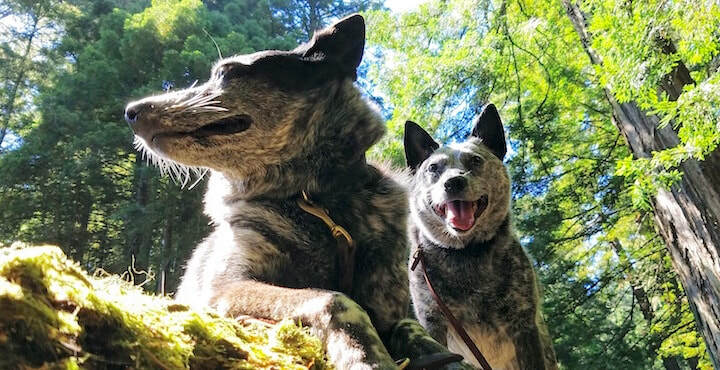 Most cattle dogs are "heelers," driving the herd from behind by nipping at their heels. Bella was different. 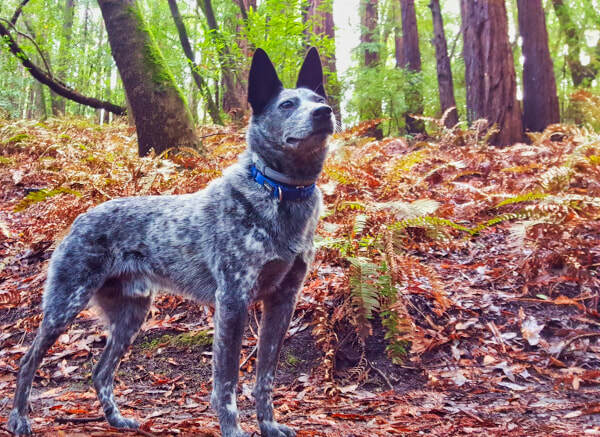 She LOOKED like a blue heeler but, according to Paul, she's what's called a "header." Headers control the flock from the front, barking or staring the animals down to steer them in a different direction or stop them in their tracks. Bella wanted to lead and to be first, Paul told me --- that was her nature. Paul introduced Bella to Frisbee, a line of site activity that headers like. Bella added a twist. She likes to catch the Frisbee then throw it up in the air herself and catch it again. Her love of Frisbee became an important tool in her training. Herding dogs do jobs such as bringing individual animals together into a group (herd) and moving the group from place to place. When I asked our veterinarian what she thought of Bella's constructions, she opined that Bella's interest in arranging her toys into groups was tied to her herding and maternal instincts. I was surprised by this mention of maternal instincts because Bella was spayed before she could have a litter. When asked to elaborate, the vet pointed out the delicate way Bella uses her paws when playing with her toys, as shown in some of the photographs I'd taken. By the time Bella was 3 years old her behavior had improved to the point that it was fun to take her places. Bella and I took a scenting class at the Humane Society and got involved in a new companion animal sport called K9 Nosework. It was during this time that Bella and I met Enzo. Bella and I are meeting Paul for an outdoor training day which is going to be video taped. Bella and I arrive a little early, around 9am. We are surrounded by agricultural lands, including a field of wild flowers where the shoot will take place. The day is starting to warm and the scent of flowers is in the air when Paul arrives with the other dogs he'll be training today. Two of them are cattle dogs who've just been pulled from a shelter where they were about to be euthanized. One of them is a young male who looks just like Bella except that he doesn't have a tail. This is Enzo. Paul hands me Enzo's leash and asks me to look after him for the day. Enzo is relaxed and easy to handle. He stays close to Bella and me. Bella is surprisingly calm in his presence. I am surprised when I see him lean over to kiss Bella and she lets him -- she doesn't usually allow such intimacies. Enzo acts like he's falling in love with her, I think, and Bella obviously likes him. My husband is taken by surprise when I tell him that I want to bring home another dog. He sees how much adopting Enzo means to me and he agrees. Bella is 3 years older than Enzo, who is still an adolescent. Enzo looks up to Bella and relies on her to show him the ropes. The role of teacher is new to her and she loves it. Enzo has a tendency to keep pestering her, like a younger brother. Bella is remarkably patient with him. When I try to walk Enzo it becomes apparent he's afraid of other dogs. This is a socialization deficit that's hard to correct. I arrange for Paul to start working with Enzo. Bella NEVER did a play bow until Enzo came along. As Enzo was learning how to play with other dogs so was Bella. The attraction they felt towards each other made them want to play together. For a long time their play was lopsided, with Bella doing most of the chasing and Enzo doing most the submissive moves. As Enzo matured and gained confidence, he and Bella learned to play reciprocally and they became a bonded pair.